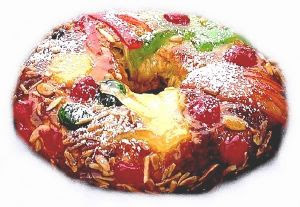 Bolo Rei is a traditional portuguese cake that is eaten for Christmas and Dia de Reis (Kings' Day - January, 6). This cake represents the presents that The Three Kings gave to Child Jesus: gold is represented by the dough, myrrh is represented by crystallised and dried fruits and incense is represented by the flavours of the cake. 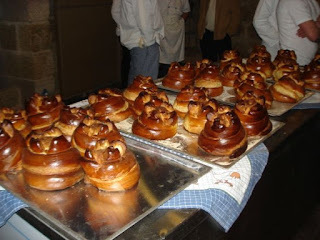 Each baker selects the fruits to include in the cake (almonds, hazelnuts, pine fruits, etc), and has its own way to make it, so that the taste will be different depending on the baker. In the recent times, some people have started to produce Chocolate "Bolo Rei", which is widely appreciated, too.